Adorable Cabin on Big Dardis Lake! Beautifully decorated and furnished private cottage on Big Dardis Lake. If you want a private, quiet break and still would like some of the comforts of home…. this place is for you. 40” TV with satellite programming and super WIFI let you stay in touch with the world, but the new world you will discover right outside your door may pull you away quickly. Enjoy your spacious 10-acre property and own private dock with a beautiful beach. Right outside your back door, enjoy an evening fire and s’mores at your own fire pit. 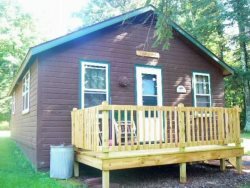 Let’s talk about the lake…you will be staying on Big Dardis Lake, a class A musky fishing lake. Big Dardis offers you your best opportunity to catch a real trophy. Catch that trophy while the kids peddle around in the paddle boat, or cruise the shoreline in the canoe, or play on the beach…there’s something for everyone to do! We have a shared boathouse, and the only paved boat landing on the entire lake. Great lake for fishing off the docks. Please remember…. Heron Hideaway is part of Memory Lane Properties, so you also have the option of bringing more friends or family and staying in our other cottage – Loon Lodge. Loon Lodge sleeps 8 comfortably and Heron Hideaway sleeps 4 ...my guess is that in the future you will want to bring the extended family and utilize the entire property!